Will Shell pay-out change Nigeria Delta? Activists in Nigeria's delta region of Ogoni have welcomed a settlement agreed between the families of nine executed activists and Royal Dutch Shell. The family of author Ken Saro-Wiwa, hanged by the government in 1995, had accused Shell of being complicit in his death and other human rights abuses. But Shell has agreed to pay $15.5m (£9.7m) to stop the case. "The settlement signals a significant change from an oil company in Nigeria," activist and lawyer Ledum Mitee said. Shell denies any wrong-doing and say the settlement is not an admission of any culpability. It says the money is a "humanitarian gesture". But will the settlement affect the current violent struggle between other Nigerian communities and oil companies? The campaign of attacks on oil installations and kidnapping oil workers has cut Nigeria's output by about a quarter in recent years. "Any settlement in favour of the victims is a welcome development," says Mr Mitee, president of the Movement for the Survival of the Ogoni People (Mosop), the organisation formed by Mr Saro-Wiwa and other activists. Mr Mitee said there may have been problems with what evidence the families of the nine men executed in 1995 could have brought before a US court. "The appeal courts could have frustrated the process," Mr Mitee said. Ben Naanen of the Ogoni Contact Group, set up to provide a united front to negotiate with the government and oil companies, said the settlement was a victory. "In the minds of Ogonis, no how could Shell deny culpability during that period, and no settlement can change that," he said. A third of the settlement, $5m (£3.2m) will be placed in a trust fund to be used for development and social projects. Although that money might not be much to Shell, it will go a long way in Ogoniland, activists say. Shell pulled its operations out of Ogoniland in 1993 after mass protests and no oil has been taken out of the ground there since. Despite the beating of a shell contractor during the protests, Ogoni activists have always said their protest was a "non-violent struggle". Sofiri Peterside, an Ijaw academic at the University of Port Harcourt, says other communities in the Niger Delta could learn a lot from the way the Ogonis have approached the conflict between them, the oil companies and their government. "They have got a settlement from an oil company, they are getting somewhere," he said. 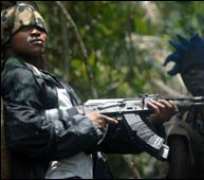 Ijaw militants in the eastern Niger Delta have been fighting the military Joint Task Force (JTF) in recent weeks, blowing up pipelines and hijacking boats full of fuel. "The proliferation of militants itself has now become a problem. The Ogonis have pursued democratic and legal means which the Ijaw nation needs to address," Mr Peterside said. Last year the government of President Umaru Yar'Adua said that a new operating oil company should be found to resume drilling in Ogoniland, where Shell still owns the operating licences. It is suspected that large untapped reserves of gas remain in the area. Ogoni leaders had hoped for a new approach from the international oil companies where they would be fairly compensated for the disturbance caused by drilling, or become shareholders in the operating company. They had hoped their emphasis of negotiation and non-violence over militant armed struggle would go down better with the government trying to find a settlement to a conflict that is costing it billions of dollars in lost revenue. But little has been agreed in the year since the announcement. Shell says it is still waiting for any formal communication on the matter from the government. To some extent, the Ogoni activists have succeeded where others have failed. The Ileja community of Ondo State, which sued oil company Chevron in the US, lost their case and narrowly avoided having to pay the company's legal costs. But it is not clear if the legal route can replace militant action. In 2008, a top official of the Nigerian National Petroleum Corporation (NNPC) admitted paying an armed group $12m to allow technicians two months' access to fix a pipeline which had been blown up. It is hard to say how much the militants actually get, but they have not given any indication they are reconsidering their strategy in the light of the settlement. Jomo Gbomo, spokesman for the Ijaw militant group the Movement for the Emancipation of the Niger Delta (Mend) said he could see no connection between the Ogoni settlement and Mend's harassment of oil companies. "I do not think there is a comparison here. We have made progress in our own way and that is why there is tension in the region which puts a focus on the problem," he said. The Ogoni trust fund represents over $333,000 (£205,000) for every year of their non-violent struggle, but armed groups make significantly more than that through violent means.